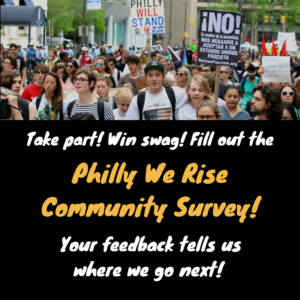 Take part in the Philly We Rise Community Survey!! Since day one, Philly We Rise has been all about the people in and around our city. We don’t answer to anyone but you, so we want to know some more about you and what you want to see from Philly We Rise in the coming months. Plus — enter for a chance to win some Philly swag! Please take a few minutes to fill out our community survey. Your feedback is so valuable to us! We can’t do this without you.